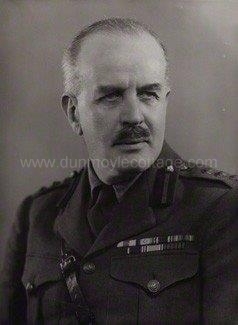 Lieutenant-Colonel Sir Ronald Deane Ross, 2nd Baronet MC (born 13 July 1888 - died 31 January 1958) was an Ulster Unionist Northern Irish Member of Parliament (MP). He was the only son of Sir John & Katherine Ross. He succeeded to the title on his father's death in 1935. Sir Ronald Ross was commissioned into the North Irish Horse on 21 June 1907 as a Second Lieutenant, and was promoted to Lieutenant on 23 April 1912. He served in the First World War with the North Irish Horse. He was promoted to Captain on 12 December 1914, and later to Major. He was awarded the Military Cross. He resigned his commission in 1938, but rejoined his regiment in 1939 and served in the Second World War, reaching the rank of Lieutenant-Colonel. He transferred to the Royal Inniskilling Fusiliers in 1947 and retired in 1950.
which was won by the Ulster Unionist Party. His wife was Lady Dorothy Evelyn Francis Ross. It is not clear if they had any children. Sir Roanld Ross died in 1958, aged 79.